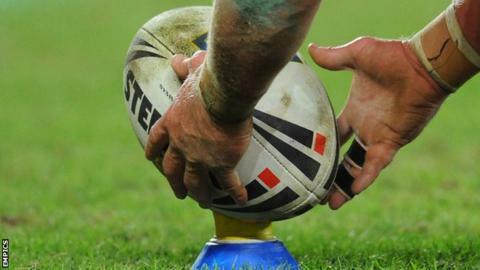 Oldham Roughyeds centre David Cookson has been handed a six-month suspension after he was found guilty of breaching the RFL's anti-doping regulations. The 24-year-old provided a sample containing methylhexaneamine. Cookson has maintained that he did not intend to enhance his performance by the use of a supplement containing the banned stimulant and has been backed publicly by the Championship One club. His suspension began at the end of August and will expire on 28 February. Speaking to the club website, Cookson said: "I broke the rule and I take the punishment on the chin. "UK Anti-Doping and the Rugby Football League both accepted that I was not trying to enhance my performance and that this was an inadvertent error on my part. "I would like to thank the Oldham club, chairman Chris Hamilton and my barrister Daniel Saoul for their support throughout this process. "It will soon be behind me and I will then be able to focus on the challenges of the new Championship One season that lies ahead." Hamilton added: "Club policy dictates that we do not condone any breach of doping regulations. "In this case, however, we supported the player because we recognised that it was not an intentional breach and it was not performance-enhancing. "All players need to be careful about the use of supplements and we will be making sure all of our players are aware of the risks."